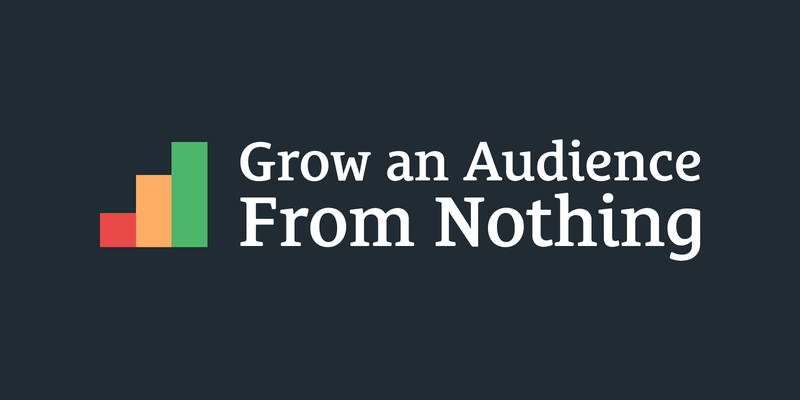 051: How Do I Build an Audience From Nothing? That’s a million dollar question. You’d love to have a following or audience, right? For some people, an audience means ad revenue. For some people, it means enough people to buy your product or work to support you. Some people just want the attention because they feel empty inside and need to feel like people love them. Hey, I get it, I’m not judging. I love feeling loved. So how do you grow a following from nothing? That’s what I’m exploring in this week’s episode. If you want to be known for something, spend more time talking about it publicly and less time talking about other things. If you’re not solving a clear problem with your podcast, then it’s going to be difficult to get people to pay attention. Talking with people online can be time consuming, but that’s how you build an audience in the beginning; one person at a time. Two great ways to build an audience for your podcast; invite people to come on your show, and be a guest on other related podcasts. 1:56 I’m going to share with you what Gary Vaynerchuck said first, because I think it’s the simple answer that is absolutely the truth. 3:14 Let’s dive in and explore each of these steps. 4:11 Jeremiah asked: How do you make sure that you’re targeting the right audience, since numbers don’t matter? 4:47 It’s easier for people to understand you when you’re all about one thing. 4:51 If you’re all about virtual reality and that’s all you talk about, write about, and publish podcast episodes about, when someone in your audience has a friend who wants to learn about VR, they’re gonna send them to you. 5:29 Gary Vee said you should be putting out valuable content every day and engaging around it and while he’s right, daily output is very hard. If you can’t put out something every day, then at least try to share something valuable related to your topic everyday. Curate the valuable content you come across. 6:23 In the beginning, you’re going to struggle with knowing what content to put out and how to use the tools available to put it out there. 7:08 There are so many things to learn when it comes to any kind of content creation, so be patient and don’t give up when you hit a roadblock. Buy books. Watch webinars and youtube tutorials. Buy online courses. Learn the tools and get comfortable with using them to create stuff. 7:35 Can you see the difference there? It’s subtle, but it exists. Worrying about numbers will not get you more listeners; figuring out ways to make your podcast even more valuable will. 8:09 If you’re just starting out, the idea of working on something for hours and then publishing it to an audience of no one is scary. I get it. 8:18 You have to overcome the part of you that wants to quit because you think that not enough people are paying attention to the thing you’re making. If you don’t push through this phase, you’ll never get to the part where the content you make is really good. 8:35 If you really want to grow an audience for your podcast, you need to be all about it everywhere. It needs to be featured on your website, on your Twitter profile, you need to talk about it constantly. Otherwise people aren’t going to notice, cause there’s a lot of stuff going on in their lives. 9:31 People will find your show if it solves a problem they’re having, or if one of their friends loves it and thinks it’s great enough to share. 9:51 If you’re making a show purely for entertainment, you’re competing with a lot of other podcasts. It’s not impossible to get people to pay attention, but it’s hard. There are a lot of options for people who want to be entertained. 10:30 If you don’t love your show enough to talk about it and be excited about it, then most people aren’t going to pay attention. Create something that you can get excited about and other people will see that and get excited about it too. 10:52 Engaging around your content is pretty straightforward. Ask for comments or feedback and respond to any comments or feedback that you get. It’s strange to me that some people don’t ask their audience for feedback at the end of the show. Just say, “Let me know what you think; email or find me on Twitter.” It only takes a couple of seconds but it shows your audience that you’re willing to talk with them. 11:46 After you hear from people in your audience, go make more content based on what you learned from those interactions. 12:07 Jeremiah asked: I’ve been asking my audience questions but I’m not getting replies. What should I do? No one hears you asking. You haven’t offered a compelling lead magnet or positioned it in a way that is seen as valuable to your target audience. You haven’t established yourself as an authority. People need to see you as an expert before they ask you questions. You’re not asking the right way. You’re either asking too many things, asking ambiguously, or asking in a way that is not clear and it making people think too much. 14:32 Building a community starts with defining your audience. People want to be part of tribes, groups of people who share a similar interest. 15:38 Jordan Newhouse asked: Where do you go to build your audience? Social media? Guest posts on other blogs? Or is it true that “if you build it, they will come”? 15:48 Building an audience involves a little bit of everything. Talk about what you care about on social media, make sure you link to your website in your various online profiles. Anywhere there’s an about page, tell people what you’re all about (bonus points if you do it in a way that describes what they’re going to get out of following you or listening to your podcast). 16:31 And yes, writing blog posts for other people’s blogs or being a guest on other podcasts is a great way to build an audience. 16:38 One of the best ways to get new audience members is to collaborate with the people who are already speaking to the audience you want to speak to. 16:55 If you’re a designer who is passionate about sports design (Hi Adam), find the people who are writing blog posts and doing podcasts and making videos about sports design and invite them to be on your show. Send them an email and ask if you can join them on your show. 17:44 You should also be introducing your audience members to each other. Use your network to make introductions and foster connections. 18:20 Part of growing a follow involves sharing yourself. You’re going to have to be comfortable with talking to people, sharing your opinions and thoughts surrounding the topic you’re talking about. 18:42 In the beginning, it’s especially important to invest in your early fans. These are the people who are going to help you spread the word about your show and the people who are going to give you honest, helpful feedback (if you let them). Invest in them. Give them access to you. 19:03 As your audience grows, it might become difficult to create and maintain connections with new audience members. You can’t really be good friends with 150 people, but you can always respond to people and say thanks and be grateful for their attention. If you want to grow an audience, put out valuable content everyday and engage with people. Know who you’re creating for and what they want and need. Make stuff for those people. Don’t be afraid to ask your audience members to share your show with a friend. Make yourself available as much as you can. Be polite and respond if people ask you questions. Be patient. Remember that the people you look up to (the people with the huge audiences) have been working on growing their audience for years, if not decades (and maybe multiple decades). The best time to get started is now. 23:30 Daniela Anne asked: If you had to pick between quality and consistency in terms of growing an audience from scratch, which would you say is the most important? 23:43 You really should aim for both, but if I had to pick one, I’d say consistency. You need to show up and create often. If you commit and show up, you’ll probably get better over time. Most people don’t get worse at something over time if they’re paying any attention at all to improving. I know it’s hard, but try not to compare yourself to anyone but your past self. Try to be better than you were last week. 24:55 Matthew Kocanda asked: I’ve been building my business for over five years. I have a few friends that always support what I do, but now that I’m trying to branch out and really try to make this commission/design business lucrative, how do you FIND the audience? I feel like I’m starting from scratch on something that’s been 5 years in the making. 25:55 If you’re creating something that’s just a nice-to-have, it’s a lot harder to make money than if you’re solving a problem. People are willing to pay money to make their problems go away, but we have endless free options for nice-to-have’s and entertainment. 26:54 Something I heard on the Lambo Goal podcast the other week made a ton of sense: If you want to make real money, solve “my-house-is-burning-down” problems. 27:26 And I know some of you are thinking, “I just want to make my art and enjoy what I’m doing, I’m not doing it to make money.” Well then we aren’t talking about business, we’re talking about art. There’s no guarantee that you’ll make any money with art you make just for yourself. It’s possible, but not promised. It’s easier to make money in business when you solve a problem or create something valuable for someone else in exchange for money. 27:48 My friend Cory Miller is currently writing a book about this topic called Nice to Have, go sign up to get notified about that when it’s ready. 28:31 Ayah Abdul asked: What is the single most important call to action I can give my listeners at the end of an episode? 28:42 I can’t tell you what the most important call to action is, you’ll have to decide that for yourself. Spend a little time thinking about it. 28:55 Remember that the more call to actions you give someone, the less likely they are to do any of them, so try to keep it to one or two. Give some kind of call to action, don’t just leave people hanging when they finish an episode. Give them something to do or somewhere to go. 30:08 Jeremiah Tutwiler asked: Do you have to create content daily? I know that this is the “Holy Grail”, but can you build an audience if you are consistently creating content on say a weekly basis? 30:23 You can definitely grow an audience if you create content on a weekly basis, but I think you should supplement it with other things, like writing blog posts and engaging in your community and posting things your audience will find interesting or valuable to Twitter and other social networks. Try to find ways to provide some kind of value everyday. Show up everyday.